I had great plans for 2017, but for those of you who follow our progress, you will know that this really hasn’t been our year! It all started around this time last year (maybe a tad earlier) when E-Dressage were forced to stop trading. With the loss of E-Dressage I had lost my monthly competitions and therefore struggled with motivation with Scottie’s schooling. But as the year drew to a close, I sat myself down and had a long hard think about all the things I wanted to achieve with Scottie and started setting myself goals to help achieve them. At the beginning of January, we moved to a yard in my village I had been hoping to have a stable at for nearly a year. 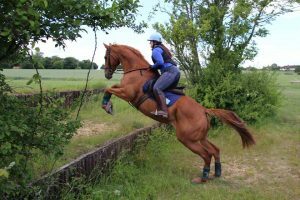 Everyone there is fairly competitive and I was sure that being there would only help us to improve.I started riding a bit more and started to explore other online dressage companies to see if I could find one what worked for me. 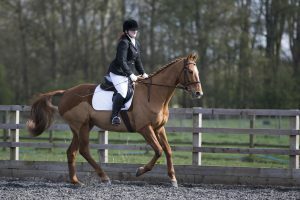 End of March I booked us in for our first competition of the year, a local unaffiliated dressage show. It would be our first show doing 2 prelims and I was really looking forward to it as Scottie had really started to come on. Despite Scottie turning very green in the spooky indoor school for our first test, he did two very nice tests, just missing out on the placings in both classes. I thought this was a fantastic sign for our year to come. I started to make plans to attend a summer training camp with other horsey friends to really help to kick start our season! However, competing is a very expensive past time and within a few weeks of our first show I received the worrying news that I would be being made redundant. I would be paid until the end April, so I had to start making smart decisions with my money. Everything, apart from the training camp I had already paid a deposit for, was put on hold. It wasn’t all doom and gloom however. 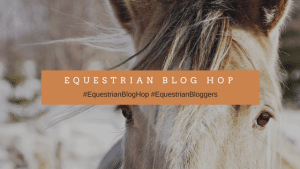 I won a free entry for the new online competition company EquiMind, which turned out to be the first company I had used since E-Dressage which really worked for me. A few months later I was delighted to be asked to be one of their sponsored riders, allowing me to continue to compete on my extremely limited budget! I also had an amazing opportunity when EquiPepper qualified for media access at Badminton Horse Trials! So to get away from all the job hunting stress I spent a week at Badminton getting some fantastic journalist and business experience. Within no time, June was upon us and I was on my way to the training camp with Scottie to really kickstart our season! Unfortunately, despite this being a fantastic few days for training and feeling like we achieved so much, a very nasty fall on the cross country course left me with a knee injury I am still struggling with 6 months later! Needless to say, once we were back home Scottie had pretty much a month of doing very little while I worked on getting my knee back to working order. Once I was finally back feeling comfortable in the saddle, I started to notice that Scottie wasn’t too uncomfortable under saddle. 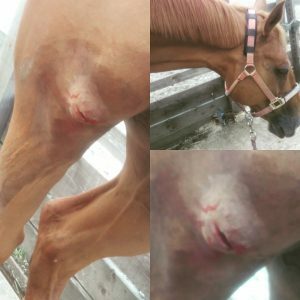 He was fairly cold backed when I first got on and after getting bucked off walking down the steep driveway on our way out hacking I knew it wasn’t any tension in my knee causing his tension and had the back lady out ASAP. It turns out Scottie’s back was in some of the best condition it’s ever been in. However, there was a sore patch under my right bum cheek. Which our back lady thought was partly due to him throwing me that way and then made worse due to my left knee injury. SInce it was so localised, she didn’t believe it was due to our saddle. After having his back done Scottie felt miles better! In fact I’m not sure he has ever felt so good or gone so well! 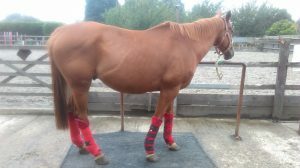 I couldn’t believe the difference in him and I started to make plans to get back out to a cross country course after our fall and potentially attempt our first hunter trials. At the beginning of August, I got the news no horse owner ever wants to hear. “Don’t worry, but Scottie has had an accident in the field and we need to get the vet out, and possibly bring an x ray machine.” He had a deep wound to the stifle area and was stood in the field not wanting to move or put any weight on it. The wound was really nasty but we were extremely lucky that it just missed all the important structures. But after a few setbacks, largely caused by Scottie taking it upon himself to escape from his pen and reopening the wound, we were back in the saddle towards the end of October, slowly building up the work until we were back to normal. Luckily Scottie came back to work really well with no obvious problems caused by the injury and time off. We are now finally back to where we were before all this drama and I am looking forward to the year ahead! We are starting the year with a visit from the saddler and back lady, so hopefully I can start making some exciting plans! Christmas chaos is now in full swing in my house, so I am hoping to find some time in the new year to sit down and start making my plans and goals for the year. So keep your eyes peeled for this! In the meantime please have a look at some of the other blogs in this months blog hop! Horses always keep us on our toes don’t they? I’m so glad Scottie is doing better. Hopefully 2018 will bring more positives!